On Friday, we farewelled Mrs Kerry Rayner who has taught performing arts at Craigburn for the past 20 years. Only recently, Kerry announced her retirement from teaching after a long and distinguished career, spanning 40 years. 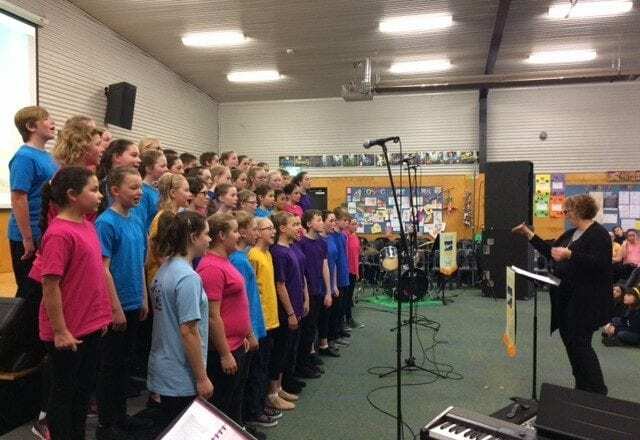 Over the past 20 years, Kerry has led the performing arts program at Craigburn, instilling her love and passion of music to thousands of children, many of whom have gone on to study music at higher levels. Over her time at Craigburn, Kerry has led school choirs (senior, junior and boys) the instrumental music program, school bands, performing arts showcases, music concerts, celebration nights and of course whole school productions such as Aladdin and Seussical. On behalf of all students, staff and families, both past and present, I would like to thank and acknowledge Kerry for her outstanding efforts, contributions and achievements at Craigburn Primary School. We wish Kerry all the very best for a long and happy retirement.